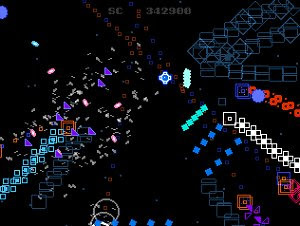 Behind the unpronounceable name Neonlgns lies a freeware arena shooter with simple retro graphics and a neon style to it. There’s no trick in the concept, it’s just a matter of surviving hordes of attacking shapes and to earn the highest score possible. It’s a fun game, especially when the screen is filled with bullets and remains of the destroyed enemies, requiring a lot of skill to overcome the difficulty.